We came to Wassaic as Education Fellows both to work with our collaborative project and to co-teach Camp Wassaic and support Art Scouts. Our initial plans were to continue our installation work which includes sculpture and sound design. However, when we arrived our plans changed and we started to work performatively while interacting with the rural and natural landscape of Wassaic. We spent hours of practice at the creek across from the iconic mill, the green field by our studio space, and the abandoned kilns. Our project is now a multi-media performance! The Wassaic Project supported us greatly, leaving us fulfilled and with a strong desire to come back and continue our strong bonds with its community. Also, we were so lucky to enjoy many nights at The Lantern, as well as dinner, dance, and pool parties, awesome open studios, studio visits, and life changing artists talks! It was an amazing experience that has affected us deeply. 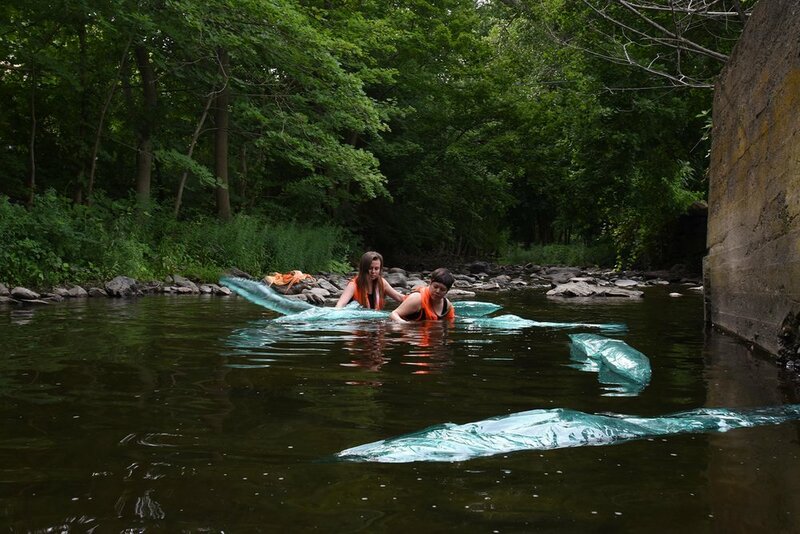 I want to start with the collaborative piece that you've been working on in the Wassaic creek. What have responding to that site and the process of developing that piece been like? Katy: We actually started working on this piece a little bit before. Jean Carla was researching the site, and we were thinking about how we could spend our time in Wassaic to connect to a site-specific idea. For us, it was very important to take our experience as women and immigrants and make the connection to the site, to the nature that we were talking about. And to think about how our personal practices can be efficiently connected. JC: Yeah, when we received the news that we were accepted to the residency, I was a bit concerned because I work as a teacher throughout the school year, and my summer is mostly for my practice and resting. So I thought, “oh my gosh, we're coming here for two months. What does that even mean?” I was a little concerned, so I started looking at maps of the area and saw that there were creeks around and thought, “that's something that I definitely want to check out.” And that's turning out to be one of the places that we're visiting a lot and developing work with. As I was researching that, I was also thinking, “Okay, what lives in a creek, what's happening there?” We're both very interested in grass, plants, insects — something that we're trying to approach is this alien existence. I realized in my research that there were going to be water fleas in the creek, so I started to look at larva and the stages of the life-cycle of the flea. I found these compelling images and sent them to Katy, and she responded very well to them. So we had that in advance. Katy: We were thinking at first about just making recordings. But then, once we came here, we responded right away to the water. It was way more tactile and physical — from the first day, we’ve kept working on and developing our ideas in this site. Katy: Costume production, sculpture, textiles, and weaving. JC: For me, photography and video, too. Katy: We’re also thinking a lot of producing a new language. Making costumes, making sound, going to the creek and responding to that — that's the way we build this new language. JC: I would add that our bodies are also the site for performance and for art. We're both immigrants identified as female, so we're carrying this archive while interacting with this environment. Our issues leak here and there, and we're fine with it. At this point in the process we are also starting to write about what we're doing, because there's a loose structure to a lot of it. But we're also improvising — recording ourselves and thinking about why we're doing this? What does it mean? What is coming out of our embodied archive that is informing and shaping this work? In your pre-interview questionnaire, you also mentioned reading Jane Bennett's Vibrant Matter and wanting to shift away from a “human-centered perspective on existence toward one that acknowledges every object as conscious and vibrant.” You also mentioned Elizabeth Freeman’s Time Binds: Queer Temporalities, Queer Histories. Those seem interesting in the context of what you just said about developing a new language. JC: I was reading Queer Temporalities in grad school and recommended it to Katy. It talks about time and chrono-normativity, how we are in this Marxist time that is mostly about labor. Right? Humans — we experience this in capitalism. And as artists and collaborators we are very much against it. So in our practice, we are finding ways of slowing time and breaking that normativity. The creek is very important for that. Remember that first time we went and we spent a long time there just floating? Katy: Yes, floating is a big part of it. JC: Until our bodies were completely wrinkled. So then we were not in this time — we were in the creek time. JC: And we don't know yet what it means to create this new language — it’s obviously being born out of radical imagination. But that’s our attempt. We're just figuring it out. Katy: I would like to talk a little bit more about Vibrant Matter. It’s inspired me and Jean Carla a lot. We're thinking about animism — the ancient desire or attempt to understand nature. We always feel threatened from nature, from forest, we want to cut it down, to make it clean, transparent, so we know what's going on. JC: We see it as an object that we can shape. Katy: Animism was humans' first attempt to create this understanding or interweaving between us and nature. And what Jane Bennett and brings is a new — or not new, “old new”? — way of thinking about it in our reality. She proposes that every object has agency; that the object is not just this inorganic entity or matter that does not affect our life. It shapes us the way we shape it. JC: Yeah, she proposes something very interesting: that if we treated objects as agents that are shaping our reality, then we would do much better with issues of garbage or global warming. Because then it's not this thing that is happening outside of us, it’s happening within us. It's part of this environment. I hesitate to call it nature, because I sometimes question what is this construct of “nature”? It immediately separates us humans from the whole environment. I don't know the answers, but those are the issues we're concerned with. Katy: And it's a part, of course, of creating this new language. We’re thinking about how we, as human beings, having this consciousness and being already separated from nature, can come back and try to connect with that nature. We’ve thought about lying in the creek and mimicking it. 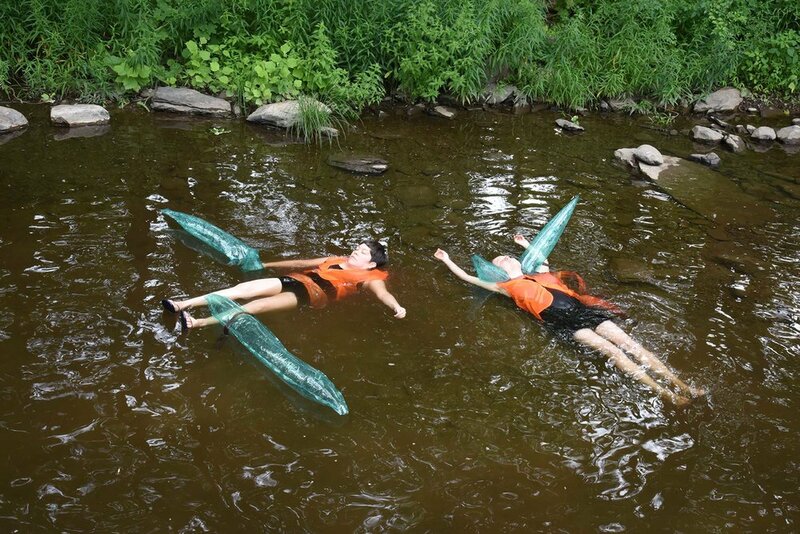 Or the opposite — creating this contrast between the creek and, for example, the safety jackets, which are very, very different from the creek. Is your work usually very site-specific? Or is that something you wanted to experiment more with here? JC: It depends. We’ve worked with site-specific projects before, but we do all sorts of group shows or collaborations with other people as well. Katy: Share time, and work through these different schedules and habits that we have — this is an actual non-hierarchical learning environment, because we have to share things that we are not used to sharing. JC: Yeah. Our work is very based on dialogue. We thought that we were very savvy in dialogue already, and, no: there are deeper layers of negotiation, and having deep conversations about how we are different and how we're gonna make it work. Katy: We learn a lot about trust. What trust means to us, to each of us. And how has your work as education fellows both influenced and been influenced by your art practice? Or do you think of them as somewhat separate? JC: It’s a strong part of the practice. The joy and the energy that I get from the students permeates the work. The work is very playful; somebody was saying “goofy.” And yes, we want that lightness because we're dealing with heavy issues. We like the lightness of the materials — they're transportable, they’re wearable, they're playful. Katy: As educators, I feel we share a part of our practice. But we also want to share a broader perspective and knowledge on contemporary art and how children experience that. We have the broader knowledge that allows us to bring kids into this art world, and make them understand that they can be very active participants in it — they bring their practices, their love, their connection to art, and express themselves. Katy: Yeah, absolutely. And their responses are so unexpected sometimes, especially with elementary school students. It inspires me right away and brings me into a different vibration, a different reality adults lose a little bit [laughs]. JC: We get trapped in these loops. Also, their choice of colors: there's no discrimination with whatever color they feel like they want to use. It's very plastic; it's fun. Katy: They're very artistic without being artists. When we’re finished working with students, we always feel like, “Ooh!” [laughs].